A British road repairman gets into a feud with the Army, gets drafted and is mistakenly parachuted into Nazi occupied France where his physical resemblance to the local German commandant triggers a hilarious chain reaction. When he is crossed in love, grocers assistant Norman Puckle joins the Navy, where he is recruited to man the first British rocket. Civil Servant Norman becomes the favourite of the rulers of a South Seas island that the British have an interest in. Norman Truscott is a store worker who dreams of stardom. Vernon Carew is a singer who's star is fading. Vernon manages to get a recording of Norman singing and passes it off as himself. Over the past few months, I've gotten into Norman Wisdom (I'd literally never heard of him before some people lent me a DVD containing some of his movies). Well, after I nearly laughed myself to death watching "Up in the World", "The Square Peg" and "A Stitch in Time", "Trouble in Store" actually seems weaker. Maybe it's that there are some scenes where he breaks into song, or that the whole movie is rather hokey, but it just can't equal the quality reached by its successors. Still, I will say that the movie is good for a few laughs. Playing his usual clumsy character Norman, he works in a London department store and hopes to get promoted, but his idiocy keeps working against him...until he and a female co-worker discover a plot to rob the store. I guess that what I really like about Norman Wisdom's movies is how he pokes fun at the class system, as the underdog messing up the stuffy rich people's lives; certainly he does that here. But they really could have done without the songs. 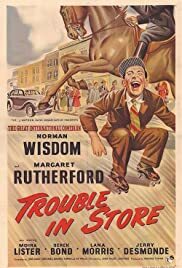 Overall, I get the feeling that maybe Wisdom was still trying to figure out his version of comedy, so I can forgive him if this flick isn't as funny as his later ones. I would recommend watching his later movies first, so as not to get put off by this one.